We offer two styles of heavy duty two sided portable wind resistant signs for commercial use on storefront sidewalks. The choice you make depends on the type of media you wish to use, rigid poster board or paper poster media. All wind resistant signs listed below feature a gray plastic base fillable with up to 115 lbs of sand. The bases also feature factory installed wheels providing easy mobility. The Wind Sign Deluxe is designed for rigid display media up to 3/16″ thick. Signs on both sides easily slide in and out and stay securely in place without the use of velcro, tape or fasteners. The Wind Sign 2 is designed for rigid display media up to 3/16″ thick. 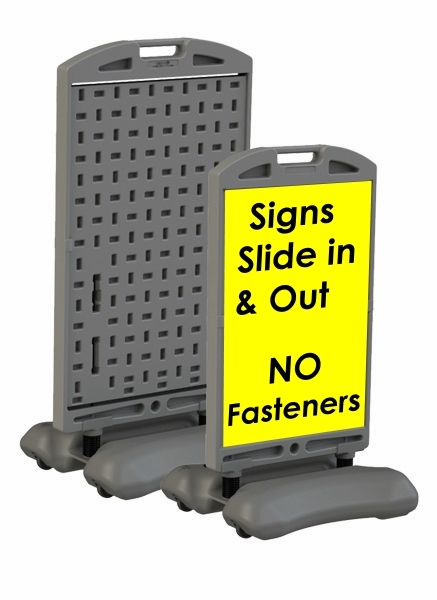 Signs on both sides easily slide in and out and stay securely in place without the use of tape or fasteners. The Snap Frame Wind Sign Deluxe is designed for paper poster displays. Easily install or remove signs/posters on both sides of the wind resistant sign in seconds. A clear protective PVC cover is included to apply over your sign material. 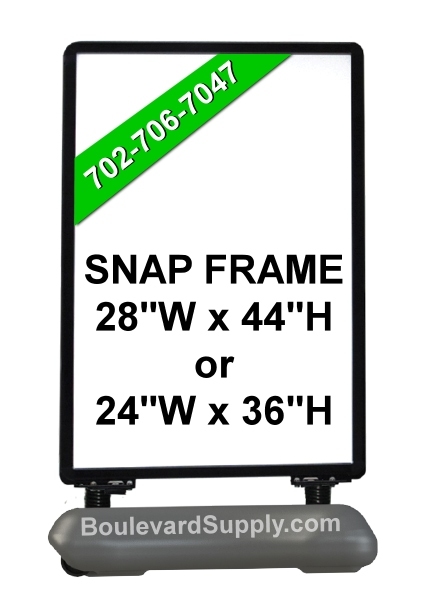 The Snap Frame Wind Sign 2 is designed for paper poster displays. Easily install or remove signs/posters on both sides of the wind resistant sign in seconds. A clear protective PVC cover is included to apply over your sign material.